We are planning to visit Crete and hope to stay beachfront in Rethymnon in June. We would like to stay at the beachfront but walking distance to the old town. We are planning to stay for 6 or 7 nights. Could you recommend at least 3 to four places with breakfast with a minimum of a 3 star rating? We are planning to fly into Chania from Athens and then travel by bus or car to the hotel in Rethymnon. Is this OK? When do you feel we need to make our hotel reservations? Sure, you can choose from a few nice places on the Rethymnon Beach which is connected to the old town via a long esplanade, where you can walk along in the mornings or the evenings, so in essence you get a beachside experience as well as the opportunity to explore the narrow streets and history of the old town. Just know that there is a road that runs along the beach in front of all the hotels, so whatever hotel you choose there you will be on the south side of the road, however this is as close as you can get to the beach in the town of Rethymnon. We suggest three hotels with breakfast below, with at least 3 stars, for you. Palm Beach Apartments - A family run hotel just 10 minutes walk from the old town and placed directly on the beachfront, the friendly brother and sister team will look after you, full meals available in the on site cafe on ground level. Kriti Beach Hotel - This hotel only 5 minutes walk to the old town and placed directly on the esplanade. Breakfast is included in the tariff, however you may find this hotel a little too big. We prefer smaller places. 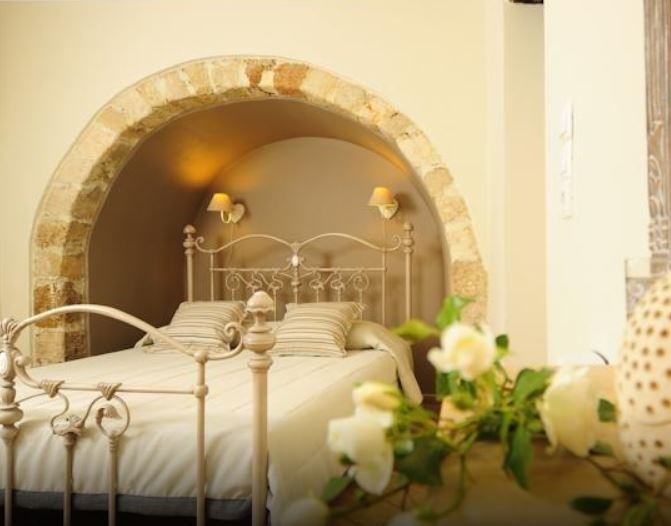 Mythos Suites Hotel - For much more character and historic charm, yet very close walking distance to the beach and located to the east of the old town, you may choose the Mythos Suites Hotel. We hope that you do, because it will give you a real experience of Rethymnon’s character. Unfortunately, the idea of staying at the beach in Rethymnon is not the best one, because it really is a town beach with many modern concrete hotels, tavernas, convenience stores and supermarkets. It is not this reason that people come to Rethymnon town. The town is all about the atmosphere of the narrow laneways of the historic quarter. You might be better off to stay in a more picturesque beachside accommodation and visit the town separately. Just an idea. In Rethymnon region there are nice beaches at Georgioupoli, Panormos, Bali and in the south at Plakias. Sure, you can fly into Chania and take a pre-booked taxi to Rethymnon to your hotel, approx. EUR95 for two or the bus which costs EUR6.80 per person and takes around 1 hour. Finally, it would be wise to book in Jan or Feb because June is peak season and this will allow you the most freedom of choice.